All staff photos published in the Record-Eagle print edition during the week of Feb. 14-20, 2010. Note: Some photos may not be available until late afternoon on the day published. Photos published on Saturday and Sunday may not be available until Monday. 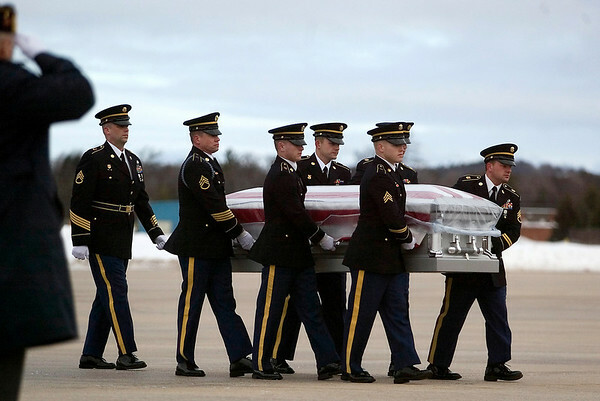 Family, friends, and honor guards from the U.S. Army and VFW Post 2780 met the casket of Army Sgt. Dillon Black Foxx when it arrived on a flight Thursday at General Aviation in Traverse City. The 22 year-old Traverse City West graduate was killed in action in Afghanistan on Feb. 5.